A couple of weeks ago, at this same time of day (6am) there was daylight, and I could be outside working in my yard, or sitting on my deck, enjoying the freshness of the new day. Today, I am having a cup of hot chocolate in my living room, watching the vague outline of my neighbour's roof and trees come into focus as the sky begins to turn from dark to a dusty light. I have a hard time choosing a favorite season when asked which one I like best. There are so many aspects of each one that I love and so, I guess my favorite is the one we are experiencing at the moment the question is posed. Today, I love autumn. I know that technically that season isn't "official" until next week, but as I have said before, nature is a law unto herself and has no regard for the timelines of man. There is sadness in the autumn as gardens are cleared of dead and dying plants that just a few months ago gave such delight with their youthful colours and scents. The last of the harvest is reaped and stored for the coming cold months. Summer clothes are transitioned out of closets and into storage to be replaced with chunky sweaters, warmer pants, and heavier footwear. I know that I can indulge in my love of all things cozy. There is a gradual change of colour in my home as there is colour change outside. I am a lover of bright, cheery fire engine red, a crisp white and a vibrant blue during most of the year, but I find myself longing to bring in the burnt oranges, barn reds, and a creamy off white of the autumn palette. This is the time I begin to rethink the colour schemes I have going on throughout our home. I am a firm believer in neutral coloured walls so that I can change the colours and tones of each living space with accessories and decorations geared to each season. I love that the colours of the harvest and the colours of Halloween are the same so that I can add a few skeletons, ghosts, bats and black cats to the mix without having to do a major overhaul. The sad thing about this season, for me, is that it lasts only a short time. Then it's onto the Christmas decor - and I LOVE decorating for Christmas, but that's for another post in the near future. 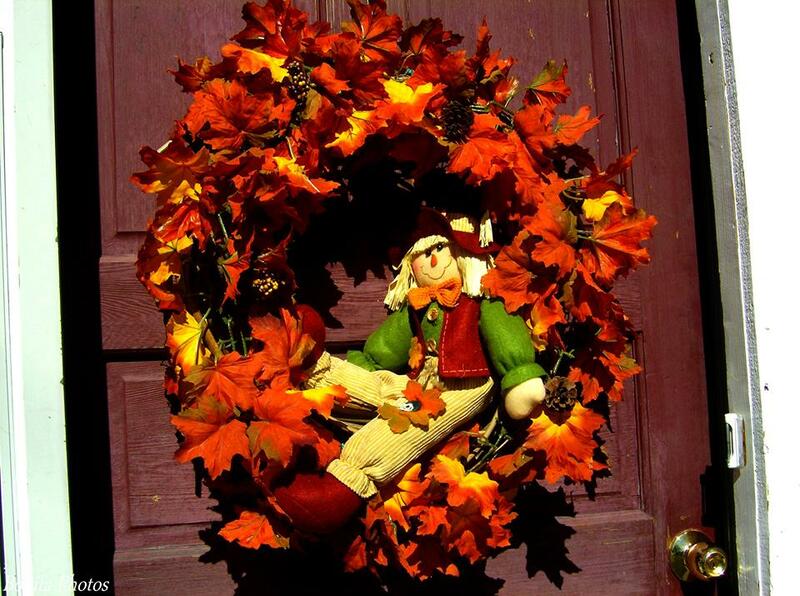 My biggest autumn decoration is my front door wreath. I always make it myself out of things I have on hand, and it is usually the same every year. I really love those huge mesh wreaths that are so glorious in their opulence. I have lots of instructions on my personal pinterest page and I just need the confidence to try my hand at making one. 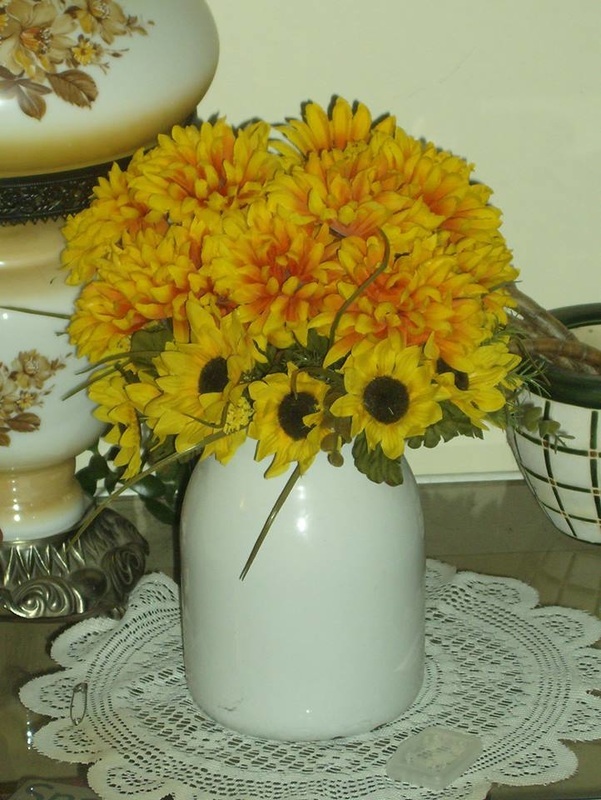 I will post some pins on our blog's pinterest page to give some ideas for autumn decorating. I use a grapevine wreath. I used to have a huge one, but in downsizing, I just didn't have the room for it anymore. I use a medium sized one and I take it apart after every season to redecorate it for the next time. I wrap two long garlands of silk autumn leaves around the wreath, tying it in place with either green twist ties (I used the ones left over from my gardening ) or tying it with green thread. This year, I am using fishing line. See, whatever you have on hand works great!! 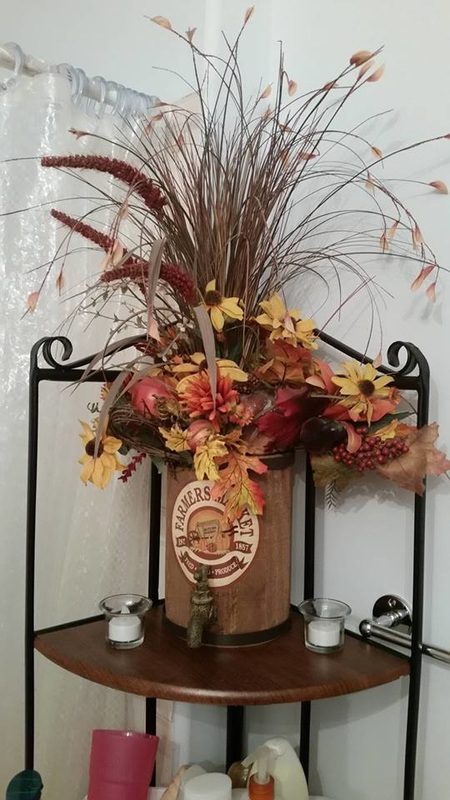 I love whimsical scarecrows and I have several that I use throughout the house, and one that I reserve for the wreath. I just tie him ( or her, depending on the way they look after being crammed in a bin for a year!) just a bit off center so he looks like he is sitting in the curve of the wreath. Be creative! Think outside the box! Decorate to your hearts content! Come join us for a hot drink on the back porch! I understand Mama K just might be in the mood for a visitor or two! I am always up for a visit!